The best dramatization: Romero starring Raul Julia. This Hollywood movie is the way that many English speakers get to know Romero. Some of the details are not historically accurate, but the majority of the film is true to Romero's life. 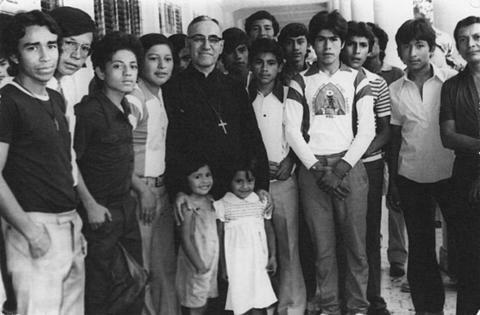 The best book: Monseñor Romero: Memories in Mosaic by María López Vigil. This book telles Romero's life story through the memories of people from all walks of life who knew him. From his early days in ministry through his martyrdom, you will get the complete story. The best collection of inspirational passages from Romero's homilies: The Violence Of Love. Short excerpts from Romero's sermons in English which you can download for free or can purchase in hard copy. A great devotional book. The best blog. Super Martyrio blog. Written by our friend Carlos Colorado a/k/a Polycarpio, this is the location to go for up to date news on Romero's canonization, analysis of his theology, and reflections of Romero in Salvadoran culture. I appreciate that you offer another website which has so much detail on Monsignor Romero. Lest you think no one would lift YOUR website up in such high regard, please know how much I very, VERY much appreciate all of your updates, insight, and links. I have been following your blog for a while and very much appreciate the information you share. My wife and I will be in Rome to attend Romero’s canonisation Sunday.